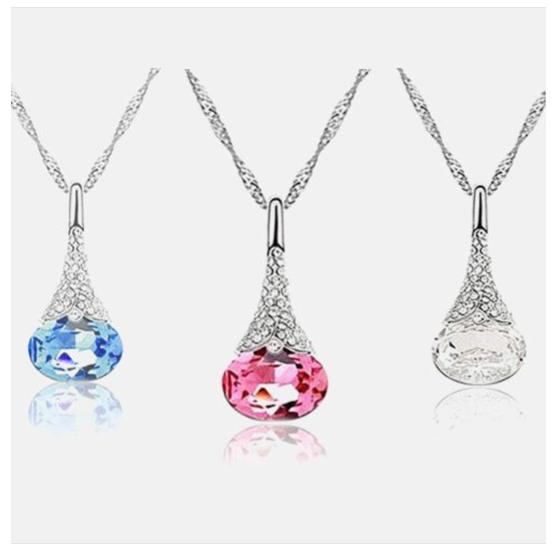 Austrian Crystal Water Drop Pendant Chain Necklace $5.99 SHIPPED (Reg. $90)! You are here: Home / Great Deals / Austrian Crystal Water Drop Pendant Chain Necklace $5.99 SHIPPED (Reg. $90)! WOW! I can’t get over how gorgeous these necklaces are! And talk about a great day for jewelry deals here at GSFF! Right now you can snag one of these Austrian Crystal Water Drop Pendant Chain Necklace for only $5.99 SHIPPED (Reg. $90)! This is an amazing BLOW OUT price for these! Stunning pendant made with Austrian crystal and adorned with diamond-cut crystals. Complete with a delicate twisted adjustable chain. The Water Drop Pendants comes in a velvet pouch. They have a Lobster Claw Clasp and the metal used is Zinc Alloy.